As a former president of Mexico, Vincente Fox, and the U.K. leader of Brexit, Nigel Farage, sparred in Colton Chapel last week over which is better, globalism or nationalism, a group of 21 students and faculty quietly met across the Quad in the basement of Skillman Library to fact check claims made during the debate and then post their findings on Twitter and Facebook. In two hours, the team identified 129 claims and using a sophisticated vetting system to make the process as unbiased as possible, researched 19. The results were posted at the feed @La_Fact. Earlier in the day, faculty from economics, anthropology and sociology, and international affairs held a panel discussion to ground the campus on issues likely to be discussed by the two international leaders. Angelika von Wahl, associate professor and chair of international affairs, prepared the 50 or so in attendance at the noon event for what to expect from a debate between a Mexican pro-global business executive and an anti-European Union British politician. It was all part of an effort to leverage the debate into a broader educational experience. Farage’s reputation for inflammatory comments led some faculty and students to oppose the debate. In letters and meetings with President Alison Byerly, they expressed concern that Farage’s views are not consistent with the College’s commitment to diversity and inclusivity. The event was organized by the Steamboat Institute, a conservative nonprofit in Colorado. It was presented at three other colleges and universities earlier this month before landing for a final stop at Lafayette. The conversation went as expected between Fox, a critic of Donald Trump, particularly the U.S. president’s immigration policy, and Farage, a Trump ally, who helped orchestrate Brexit, Britain’s 2016 vote to leave the European Union. The debate was moderated by Mary Kissel, a member of The Wall Street Journal editorial board. Farage emphasized that he was a nationist as opposed to a nationalist. “We voted Brexit because we wanted to be an independent, self-governing, democratic nation. 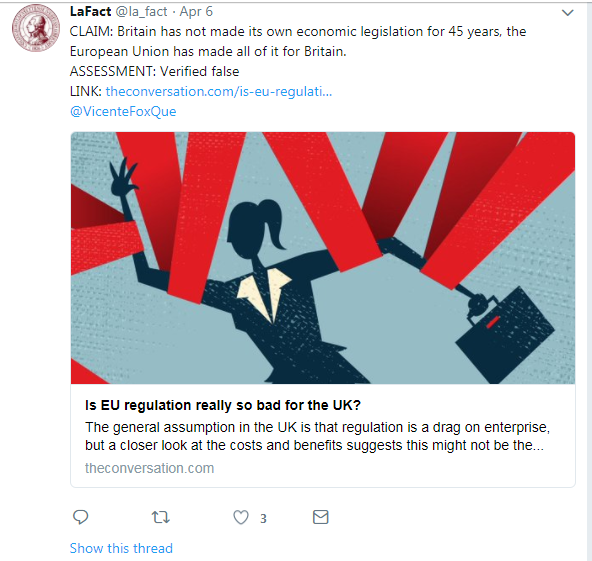 We voted Brexit because we want our laws to be made by the people we vote for,” he said, noting that in the past 45 years all of Britain’s economic legislation has come from the EU. From there, assertions rolled fast and furious across the screens of the Lafayette veracity squad. 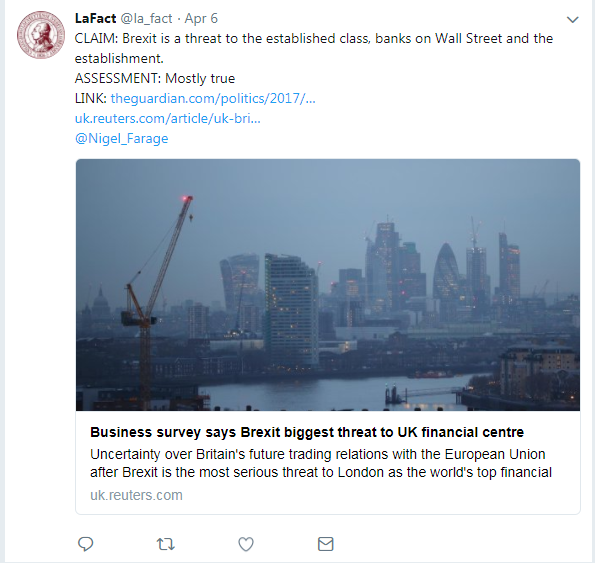 Farage framed his opposition to the North American Free Trade Agreement by saying not everyone plays fair, especially China, which has abused its position in the world. “China drastically increased its steel production when steel demand was low to destroy the European and American steel markets,” he said. Fact checkers? 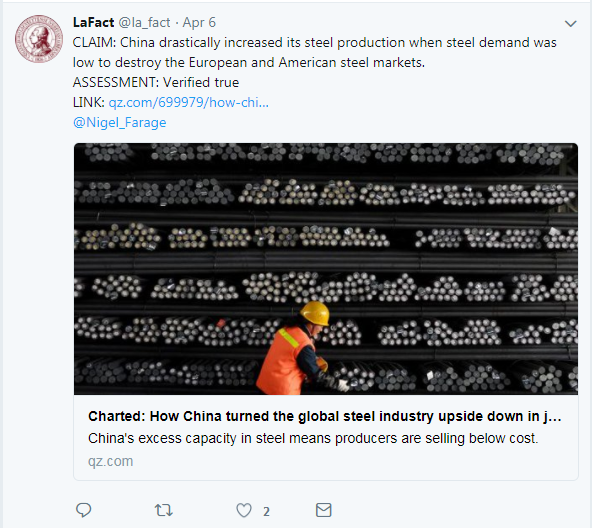 True, they ruled, citing statistics from the World Steel Association. Farage then noted he supports Trump’s decision to place tariffs on Chinese steel and aluminum in retaliation for flooding the market. Fox said Mexico buys over $40 billion worth of yellow corn from the U.S., and if Trump pulls out of NAFTA, Mexico will purchase more of the livestock feed from Brazil and other Central American countries. 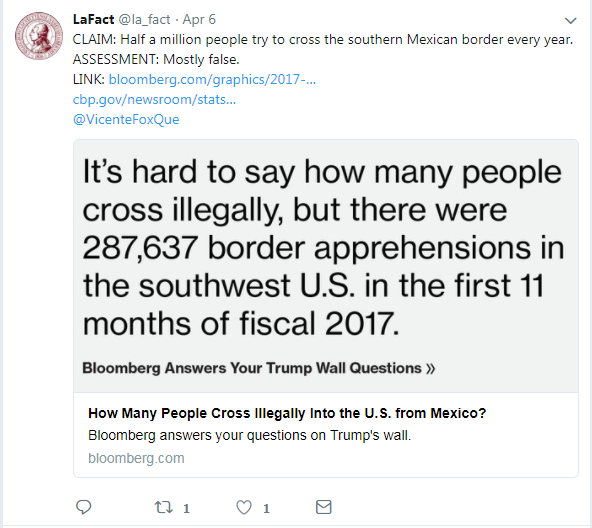 The real number is around $2.6 billion, fact checkers tweeted. The idea to fact check the debate came from Austin Botelho ’18, an international affairs major, who was looking for a platform to harness energy surrounding the event in a productive way. “We thought it would not only be a fun project, but a way for people who don’t have a good grasp of issues to hear the facts,” says Botelho, who applied his fact-checking skills on the night of the debate from a hotel in Oklahoma, where he had presented a paper that day at the National Conference for Undergraduate Research. Bohelho brought his idea to von Wahl and Caleb Gallemore, assistant professor of international studies, who devised a sophisticated system that involved four groups of students, faculty, and librarians working in separate rooms to ensure impartiality. The first group was called harvesters; their job was to watch the live stream of the debate and decide whether a statement or claim made by Fox or Farage could be investigated. “People say a lot of things that are not checkable,” von Wahl says. 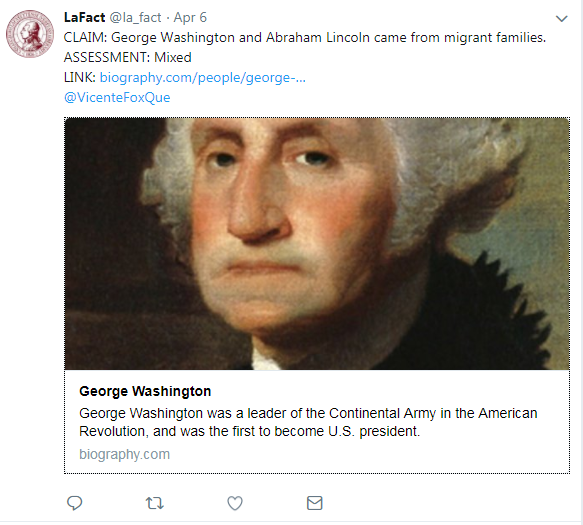 Those claims were then passed without attribution to the sorters, who researched whether the statement was true, false, mostly true, mostly false, or mixed. The next step involved checkers, students like Robertson who determined whether the sources used by sorters to evaluate a claim were reputable. If not, they sent it back to the sorters. Those that passed muster moved to the tweeters for posting. When the debate ended, students and faculty in the separate rooms erupted in applause. This exercise was very important and valuable in the present environment of deliberate false claims and exaggerations. Congrats to those who came up with the concept and organized it to be unbiased. Fantastic learning experience for the students and for all us voters. This program is outstanding. It’s always best to deal with provable facts. More debates should be conducted this way. The participants would be required to use actual facts instead of emotions and their own facts. Very much liked the fact checking protocol. We should use it in future Presidential debates!